Home ASIA Is ‘terrorist’ designation appropriate response to IRGC’s atrocious actions? The USA’s announcement to designate the Iranian Revolutionary Guard Corps (IRGC) as a terrorist organization has prompted a heated debate on broadcast-media across the world as well as on various social-media platforms. The move was on the cards for a long time due to the IRGC’s support for the spread of terrorist proxies across the Middle East. Whether or not the decision was a sensible one needs no further consideration. Yet the debate that followed on mainstream broadcast-media and various social-media platforms need to be addressed. For this, a bunch of incidents and happenings that have been taking place in Middle East have to be considered alongwith their connection to the IRGC. Syria seems the appropriate conflict zone to start with. As Iran’s leaders always try to portray themselves as the symbol of moral values, many in Iran and elsewhere expected them to act — or atleast speak — for the slain victims and against the heinous activities of Bashar-al-Assad and his loyalists. Iranian leadership instead chose to side with the longtime ally Assad. What followed was horror, terror and death. First, Iranian leadership’s military arm, the IRGC, had led the campaign of killing the Sunnis and non-twelver Shias in thousands to depopulate many Syrian and Iraqi areas from Sunnis and non-twelver Shias — something which is no less than genocide. This fear of being killed for their sectarian identities had compelled a portion of the remaining Sunni and non-twelver Shia population to leave their homeland and seek refuge in other countries (particularly neighbouring countries and Europe) so that they could escape the genocide. Compelling these people out of their native land, and in some places actively driving them out from their native areas, is something which amounts to ethnic cleansing. Two clear examples of these IRGC-led campaigns are the sectarian killing and cleansing in Iraq’s Fallujahand Samarra. In Fallujah, the Iraqi forces and Iran-backed militiaskilledthousands of innocent Sunnis in the cover of “liberating”the area from ISIS. In the areas around Iraqi city of Samarra too, the Sunnis were driven out with the intention to create a Sunni-free corridor. 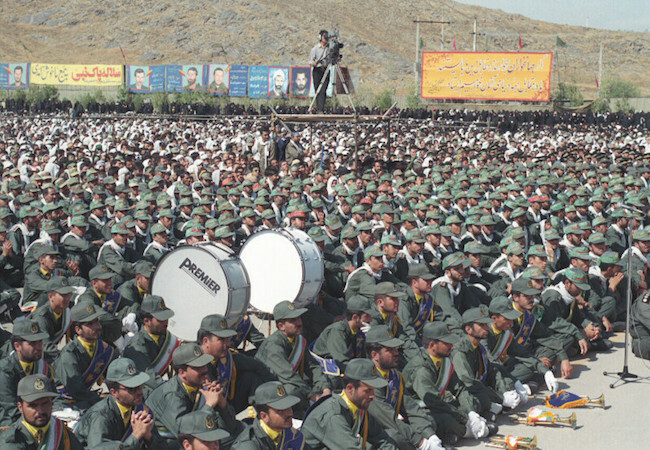 All of the above said killing campaigns had been monitored, aided, funded and managedin the ground-zero by the by the Quds Force, which is responsible for carrying out the IRGC’s campaigns outside Iran. In Syria, the IRGC had carried out the campaign with the help from Assad’s army and Iran-backed Lebanese militant group named Hezbollah. In Iraq, the IRGC had carried out the campaign with the help of sectarian elements in Iraqi army, Iran-backed militias and Hezbollah. Although, for years, the IRGC has been training the terrorist proxies in a number of regional countries, the IRGC-members went a step further in the recent times to directly engage themselves to the killings of innocent civilians in Syria and Iraq based on sectarian identities. Worth noting that every mainstream global media had either published articlesor broadcasted the footages of the aftermath of the repeated gas/chemical attacks on Syrian civilians allegedly carried out by the Bashar-al-Assad’s airforce in rebel-held areas. Assad could certainly not have ordered to carryout these attacks without the backing from the IRGC and without Iranian leadership’s endorsement. The broadcasted-footages clearly show how these attacks killed civilians, especially the children, who had to go through enormous sufferings and pain before ultimately taking their lives. All the atrocities committed directly or indirectly by the IRGC suggests that if it is wrong to designate the IRGC as ‘terrorist’ organization, it would also be wrong to designate any other atrocious group as ‘terrorist’. If it is right to designate any atrocious group (including ISIS) as ‘terrorist’, it was equally right to designate IRGC as ‘terrorist’. Bahauddin Foizee is an international affairs analyst & columnist, focusing mainly on the geopoltical trends and events taking place in the overlapping mega-regions of Asia-Pacific, Indo-Pacific and Indian Oceanic Region as well as in the greater Middle East.